KCW Day 2 arrived amid "a wintery mix" coming down all day. It's dreary and bitter cold outside…perfect for staying in and sewing! I've had this gingham interlock knit since I was in college. I never got around to the project I bought it for. It's nice to finally put it to use and get it out of my stash! I took the tank top pattern in Ottobre 1/2013 (#2) and lengthened it to about 28" from the shoulder. Next time, I'll draft the A-line from just under the armpit instead of halfway down the body since it's not quite as loose as I'd like. On the other hand, as an actual tank, I think this pattern has a very nice fit! Miss M loves her new nighty! I love how simple it was to put together. 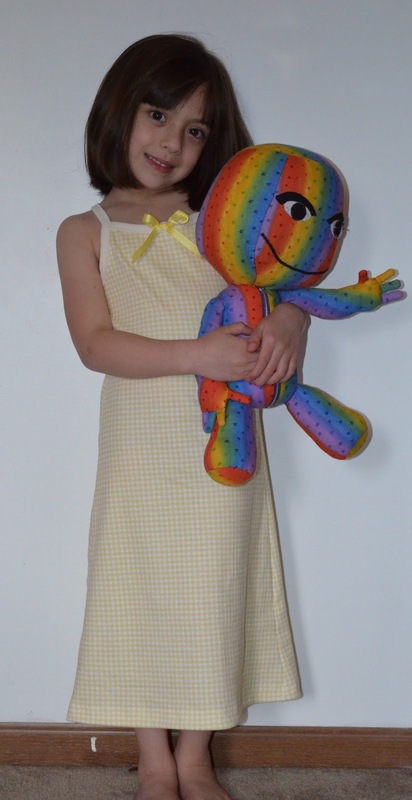 Miss M modeling her new nightgown with Sackgirl! Tomorrow's project…a mesh tank top for Little Guy!